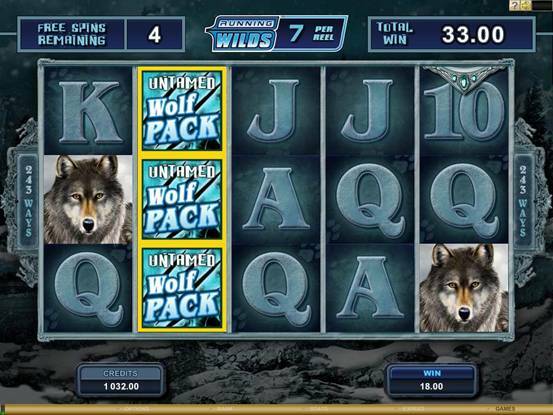 Jackpot City Casino's 'Untamed' series of slots has proved exceptionally popular with players due to slick game action and graphics, and the host of innovative and rewarding features carried by each new slot. 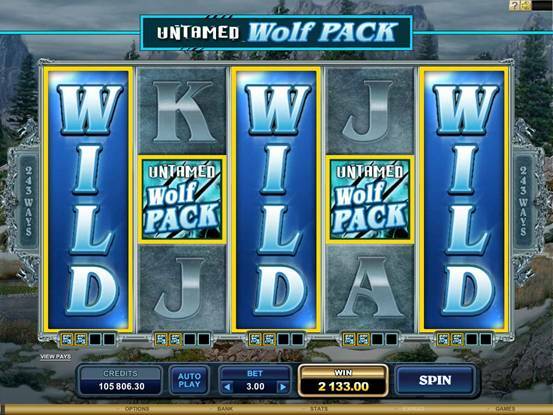 UNTAMED - WOLF PACK is the latest 5 reels, 243 Ways to Win video slot in this top quality line, and maintains the high standards players have come to expect, entertaining them once again with features like Collect-A-Wild, Lucky Nudge, Running Wilds, Your Gamble and generous Free Spins. The setting for the theme is the great Canadian Wilderness, full of majestic mountains, tall forests, sparkling streams and shadowed valleys under giant blue skies. It's the kingdom of the ghost-like wild wolf which gives this game its title, hunting the plentiful deer and other wild life in one of the world's most spectacular locales. 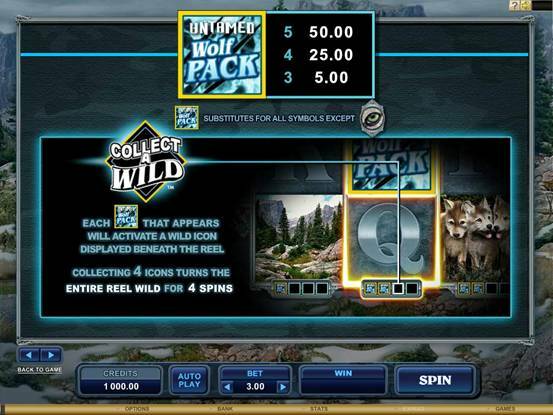 The outstanding graphics depict the breath-taking scenery and the almost wraithlike animals in their natural habitat, providing a variety of symbols that enable players to build winning combinations using Wilds, expanding Wilds, Scatters, Free Spins, and a fun Gamble feature. In Collect-A-Wild, players get extra action from a feature that triggers automatically every time a Wild symbol lands on a reel. The game immediately credits the player with a Wild Token recorded in a counting panel beneath the reel, and when four of these tokens have been collected the entire Reel turns Wild on the next spin and remains Wild for 4 spins. 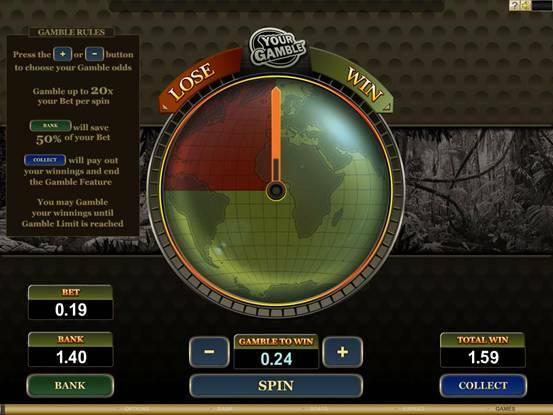 Up to 5 Reels can turn Wild, significantly boosting the players' chance of reward. Players should also be on the alert for the Lucky Nudge symbol - a jewelled eye which is the Scatter and may peek from just above or below the reel edges. 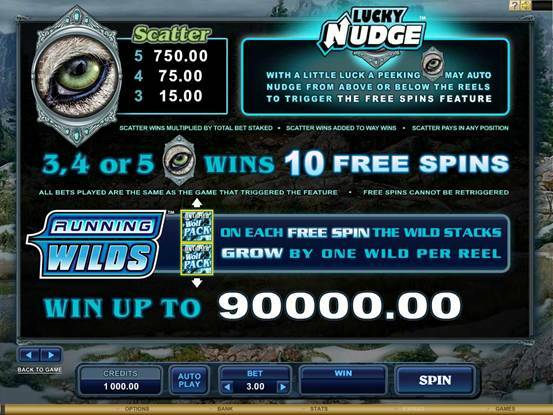 If there are two other scatters on the reels, the peeking scatter may nudge onto the screen, triggering the Free Spins feature and giving the player 10 free spins with a 1x multiplier and more chances to prosper. 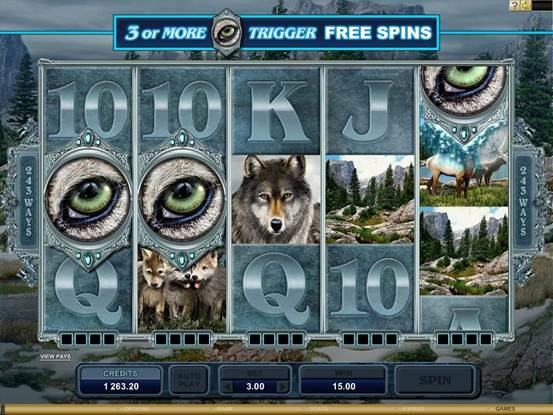 The Running Wilds feature is a player benefit that kicks in during Free Spins, where the Wild symbol stacks and increases by one Wild on each subsequent spin of the remaining cycle of the player's Free Spins advantage. Finally, the Your Gamble feature has been included by popular demand. This innovation enables players to adjust Gamble odds according to personal preference. It lets players gamble up to 20x a single win as many times as desired, still allowing them to bank up to 50 percent if chosen; it's all about player flexibility and the free choice of a gamble amount, placing control in the players' hands. 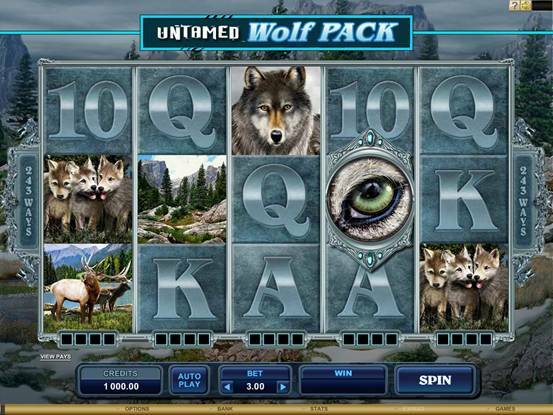 The entire Untamed - Wolf Pack experience presents a player-friendly game that provides lasting entertainment and the possibility of big rewards - over 90,000.00 in both base game and Free Spins is achievable - on relatively small bankrolls between 0.01 and 0.05, with a maximum bet of 22.50. Take a walk on the wild side by clicking over to Jackpot City Casino now! Golden Tiger Casino Play Untamed – Wolf Pack Video Slot with $1500 totally free. Without leaving your home you have access to over 456 Las Vegas style casino games including all the favourites such as blackjack, roulette, slots and video poker. State-of-the-art gaming software is the most advanced in the industry - the realistic graphics, exciting sound effects and smooth gameplay are truly unbelievable! The wide betting ranges make our casino games accessible to everyone from the novice right through to the experienced gambler.